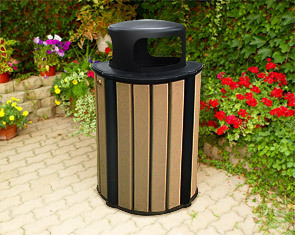 This attractive 32 gallon round trash receptacle is constructed with recycled plastic slats and aluminum frame. 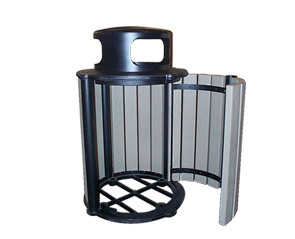 Available in three-opening top model ideal for multi-directional traffic locations. Access the included rigid plastic liner via the hinged side door for easy maintenance. Orders of quantities of 3 or less units ship pre-assembled, for orders of 4 or more the units are shipped knocked down. 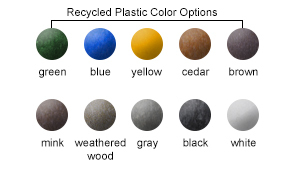 Recycled Plastic Slat and Aluminum Frame color options are as shown below.